In tune with the social nature of today’s gaming industry, Nokia’s Ovi Store is making available a slew of free mobile Flash games enhanced for competitive play in a unique collaboration with Singapore-based, multiple-award winning design studio, Breakdesign. In conjunction with the availability of the new Flash games, a series of monthly competitions will be held for four months beginning 7th of May across the South East Asia Pacific region, including Malaysia. “As early as the 1990s, Nokia has connected people through mobile gaming with the Snake game that became a classic over time. Providing a rich mobile gaming experience is integral alongside the most essential, communicative and organizational features of any Nokia handsets,” said Nelson Wee, Regional Services Marketing Manager, Nokia, SEAP. The new games lined up for the competition are That Roach Game, Ninjani, Dawn of the Fly, Dawn of the Fly 2, Monsterilla, 10 PM and Horseface. These titles will make their way to Ovi Store progressively throughout the competition period and are exclusively available on Ovi Store only, until the competition ends in August. That Roach Game SA, a well known flash game already today, is available on Ovi Store and is also included in the competition. The game competition is hosted on Breakdesign’s game platform, Barking Seed at www.barkingseed.com. Participants stand a chance to win one of the 25 prizes monthly, including the Nokia X6, the Nokia BH-216 and exclusive Barking Seed merchandise as well as other attractive prizes. Simply download any of the listed flash game titles from Ovi Store (http://bit.ly/dgGQPM) and start submitting scores! More details can be found at www.barkingseed.com. Gamers can also post messages on the individual “game walls” as well as send fan mail to their favourite Breakdesign game designer from within the game. The mobile Flash games will be supported by 29 Nokia devices, including an array of full QWERTY, touch and keypad devices. Anyone with a valid street address in these countries are eligible for the contest: Australia, New Zealand, Indonesia, Singapore, Malaysia, Brunei, Thailand, Philippines, Vietnam, Cambodia, Laos, Bangladesh, Nepal, Sri Lanka or Bhutan. These flash games are made available globally while the competition is only open to consumers in the South East Asia Pacific region. Nokia devices supported include the Nokia 5800 XpressMusic, the Nokia 5530 XpressMusic, Nokia 5230, the Nokia N97, the Nokia X6, the Nokia N97 Mini and the Nokia E52. The full list of supported Nokia phone models are available at www.barkingseed.com. Nokia Conversations has recently posted a new video promoting the OVI Store and showcasing a few key apps like Facebook, Qik and Gravity. The video was directed by Hiro Murai, a music video director who has worked with The Fray and Bloc Party and produced by Partizan, Michel Gondry’s award winning production company. The style of the video is imaginative and fun, as they try to stay away from the typical tech promo videos. Goodbye N-Gage. We will miss you. This is gonna be one very sad news from Nokia. According to them in the latest N-gage blog post, Nokia will be shutting down the N-gage gaming service under the OVI umbrella by 2010 and they will ‘no longer publish new games for the N-Gage platform’. That doesn’t mean the end of the gaming segment for Nokia because according to the same blogpost, the games will be provided via its Ovi Store service instead. Nokia will no longer publish new games via the N-Gage service. Instead games will be made available via the Ovi Store. N-Gage games can be purchased until September 2010. Other parts of the N-Gage service, including N-Gage Arena, will be availale throughout 2010. The N-Gage application will continue to ship on some older devices. However new devices will not ship with the N-Gage application. All current N-Gage will continue to work. The online (Arena) elements will continue to work throughout 2010. However, subsequently, the online elements of N-Gage games will no longer work. Nokia’s future gaming strategy will be based on Ovi Store distribution. Thanks Nokia for bringing us a revolutionary gaming service since 2003 and hope the OVI Store will create a new wave in the industry. Right out of the oven! Nokia just announced 2 new music devices modeled X6 and X3 at the current Nokia World 09 event at Stuttgart, Germany. It’s a whole new design for their music line and the X6 is the slimmest touchscreen device Nokia every produced at only 14mm thin! The X6 also packs with 32GB of internal memory, 3.2inches touchscreen and 35 hours of music playback. The X6 is also a Comes With Music device. That means you can get music into your device right out of the box without the need to purchase anything extra. The 3.2inch touchscreen is suitable for viewing photos videos and the new contacts bar on the homescreen allows users to pack in 20 favourite contacts for easy access. What other exciting stuff are there in the X6? 16 days standby time, a 5-megapixel camera and Carl Zeiss optics, dual LED flash, TV-out, video editing, online sharing, Nokia Music store, full web browser and Flash Lite support, A-GPS, Ovi Maps and Playlist DJ. Gaming? YES! Spore is included, along with DJ Mix Tour and Asphalt4. The Nokia X6 will be available in the 4th quarter of 2009 and will be priced at about 459 Euro before tax and subsidies. The other Xseries device catered for a casual level of users is the X3. Unlike the X6, it runs on the usual Nokia S40 OS and it is the first S40 device with Ovi Store enabled. The X3 comes with a 3.2megapixel camera, 2.2inch screen, stereo speakers and supports up to 16GB of memory via MicroSD card. It also comes with Bluetooth 2.1 for wireless music headsets and 3.5mm headphone jacks if you want to use your beloved music earphones. The X3’s messaging feature spots the new Nokia Xpress Audio Messaging and Nokia Messaging 2.0 brings users’ existing email and IM accounts to the device. The Nokia X3 will be available in the 4th quarter of 2009 and will be priced at about 115 Euro before tax and subsidies. Download Shazam for your S60 Device for FREE! 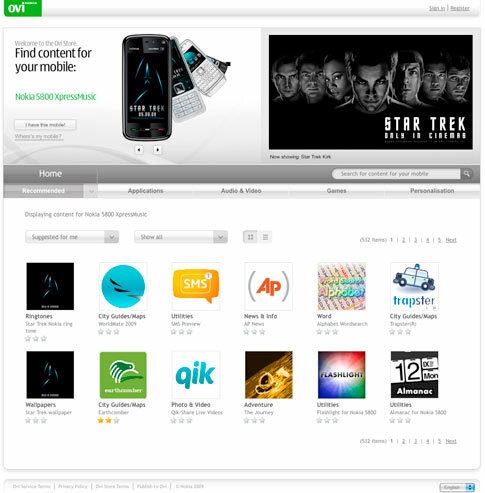 Shazam has recently announced that it’s popular music tagging mobile app is now free to download from the OVI Store. This is to celebrate the release of Nokia N97 in the market. This promotion is only valid until 30th November 2009 so you better go get your copy from the OVI Store as soon as you can! hehee. (Shazam is one of my favourite app on the N97 by the way). So how does Shazam work? Simple. Hear a music you like playing on radio and wanna know what song is that? Connect to the Internet via 3G or wifi. Place the phone near the speaker. After Shazam listens to the song, it will try to match it with the database online and present you with the closest match. 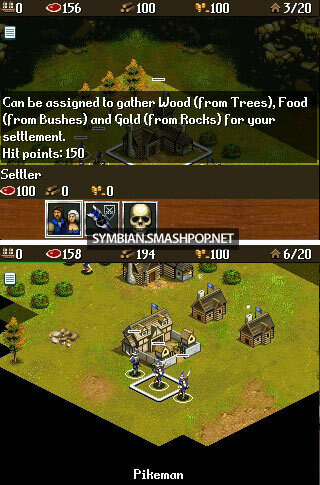 As you can see from screenshots, left: listening screen, right: result screen. There has been quite a lot of new apps for download in Ovi Store and I was browsing it last night, this comic caught my attention. This comic was produced by Carnival Comics and they announced that this is the first mobile comic app for Nokia phones and it was available for download since 21st July 09 through OVI Store. Some screenshots of the mobile comic. It has a total of 7 chapters and the one available for download is chapter 1. Do visit OVI Store and download this app for your S60 touch devices now! One of the more recent addition to the Ovi Store is the Bing widget. Bing is a new search engine by Microsoft. It has similar features to Google like Web search, image search, video search, news search etc. The widget, which is now available for FREE download on OVI Store is compatible with S60v3 & S60v5 devices. You can get it by pointing your PC or phone browser to http://store.ovi.com. Here’s a screenshot of the Bing widget on Nokia N96. As you can see, search results are categorised in tabs. The widget looks and works the same on the touch version of S60 devices like 5800 & N97. Get the Bing widget for your phone now! Facebook App Now Available on Ovi Store! The one app that S60v5 users have been waiting for is now available for free download on OVI Store! The facebook app is a native s60 app that can be installed on 5800 and N97 as it is optimized for touchscreens. This facebook app has big buttons and very clean layout, very much like the website. I am sure we do not need stylus for this interface. heh. Here are some screen shots taken of the app on my 5800 XPM. As you can see, that’s the login screen and once connected, it will bring up the news feed screen. Notifications like messages, pokes and friend requests are on top and at the bottom of the screen are buttons to your own profile, friends list, photos and inbox. Clicking on the green “+” sign will allow you to leave comments on the items selected. Photos can be viewed in landscape or portrait mode. We can move around the gallery by clicking on the arrows and the Tags button will toggle the name tags on the photos on/off. Screen on the left is how my own profile looks like and the one on the right shows the comment screen when you comment on a photo. Wanna get Facebook on your 5800.. or *cough*…N97? Check out OVI Store now! Ovi Store is now LIVE! We’ve all heard of it… waited for it.. and now it’s finally live! Ovi Store… is the one stop shop for Nokia users to download apps, ringtones, videos, games and many other interesting contents for the mobile. You can visit the store using your PC at http://store.ovi.com but it is recommended if you view it using your phone browser as you can directly download apps without the need to send the SMS link to your phone(if you are on PC). Be sure to get yourself an OVI username (if you still havent got one).. cos you need it to sign in to Ovi Store to download contents to your own phone or send to your friends. Here are some screenshots I took when I was surfing Ovi Store on my 5800. Upon arriving on the site, you will be prompted to download and install the Ovi Store app for better and smarter experience. So I did. As you can see on the 2nd screenshot, I was signing in to my OVI account. You can do that by scrolling down to the bottom of the page in the app. This is how the app looks like on the 5800. Touchscreen experience is always the best.. ahahhaah (cant wait for the BETTER experience on the N97.. lol).. ya so you can surf around to look for the contents that you like. The green tabs on top categorises the apps to games, apps, recommended, my stuff, personalisation and audio & video. Once you click on an app that you are interested in, it will switch to the screenshot on the left.. more info about the content and buttons to download and send to friend. If it’s a paid app then you will see the option to buy. Do check out the all new OVI store now! I was trying to get into the Download section on my 5800 to get the QuickOffice application when I noticed a changed in the icons. The yellow folder icons are now gone and replaced with light blue ones. Could this change be in conjuction with the upcoming OVI Store? Very low possibility but we shall wait and see. In the applications folder I see 2 new additions: Mobisystems Diets and Widgets. The former is just an app to calculate and recomment diets and the latter contains all possible widgets that can be installed on the phone. (and currently it only has Accuweather in it). The rest of the contents are now provided by Jamba, a mobile phone content provider, based in Berlin, Germany which previously trades with the name Jamster!. Check out the ‘Download!’ folder on your phone now and you might find some interesting stuff there.